Home PowerShell SharePoint SharePoint 2010 SharePoint 2013 SharePoint 2016 Users and Groups How to Change SharePoint Group Owner using PowerShell? How to Change SharePoint Group Owner using PowerShell? Follow these steps to update SharePoint group owner in SharePoint. From the group page, Click on Settings >> Group Settings >> Set the new group owner in "Group Owner" field. Hit OK to save your changes. This changes owner of the group. 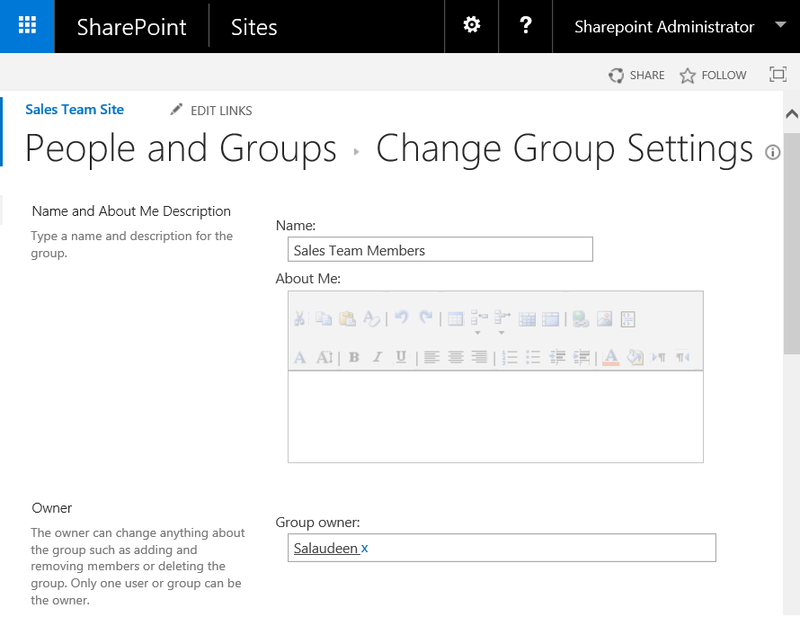 Changing the group owner from SharePoint web user interface is quite simple. But At times, you may have to replace an existing group owner with a new user across multiple site collections. Ideally, we have to leverage PowerShell for these kind of admin tasks. Let's change SharePoint group owner via PowerShell. Here is the SharePoint PowerShell to update group owner. You need to have either Farm Admin or Site collection Administrator permissions to change owner of the group. Write-host -f Green "Group Owner updated successfully!" Write-host -f Yellow "Group Doesn't Exists!" This PowerShell script changes group owner programmatically for the given group name. By default, you can specify only one user as a Group owner, So its a good idea to set group owner to Farm Admin account or use SharePoint group as Group owner! While the above script changes the group owner for given group name, Lets change group owners for all groups in the entire site collection. Here is the PowerShell script to set group owner for all groups in the site collection. Here is my another post to change group owner in SharePoint Online using PowerShell: How to Change SharePoint Online Group Owner using PowerShell? If a site inherits permissions - which means: It inherits groups from the parent site. So, changing group owners at its parent site should be enough.